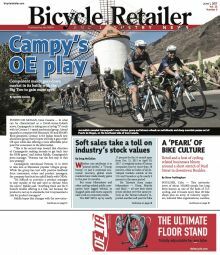 In addition to our daily online news coverage, Bicycle Retailer & Industry News is available in print and digital format, mailed or e-mailed to you 12 times a year. The print edition offers unique editorial content, interviews of industry insiders, insight into industry trends and in-depth news analysis that you won’t find online. Subscriptions are free to qualified bicycle retailers in the U.S. For address changes, single copy sales, subscription information and customer service inquiries, call (818) 286-3129. Online services are also available for existing subscribers including the ability to renew, update your address or access other subscriber services. Subscriptions for non-qualified readers are $68 per year. A one-year foreign subscription, payable in U.S. dollars, is $82 in Canada and Mexico; for all other countries (airmail only), a one year subscription is U.S. $182; two-year subscriptions are: U.S. $109; Canada/Mexico,$131; international, $291. 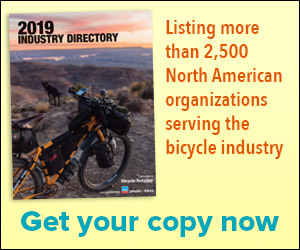 Bicycle Retailer & Industry News (ISSN 1069-8493, USPS 010-073) is published monthly.